Backed by our skilled professionals, we are involved in providing Container Maintenance Service. Owing to the wide experience of this domain, we are instrumental in providing Container Maintenance Service. Capitalizing on the capability of our adept employees, we are instrumental in offering Industrial Container Maintenance Services. Executed by competent personnel, these services are broadly commended and praised in the industry for their timeliness, on time completion and exactness. Additionally, these could be modified as per the specialized desires of our customers. We monitor the working of your installation, provide regular service and ensure that you get a full uptime. we have well organised container repairing unit, can handle expeditiously on the spot any type of repair/replacement efficiently and promptly round the clock. We also manufacture container spare parts. Our Most Skilled and certified Engineers, Welder & Fitters under take maintenance of all the types of containers within live time and most modern infrastructure. We also update estimates in live time so that our customers can get update from any part of world. - Repair & maintenance and storage facility for empty conts. - Warranty service, using standard materials. Materials costs and hourly rates are on the reasonable prices. - Reefer container maintenance by qualified technicians. - Other related services requested by customers. 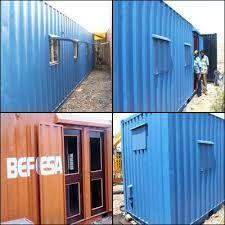 We Senthil Aandavar Container Yard are the service provider in maintenance of containers. We have extensive facilities for dry container repair and refurbishment. Our terminals can handle upto 80-100 containers in a day for a variety of jobs from cleaning, washing to welding and fumigation.